Extra Virgin Olive Oil DOP di Tola, monocultivar Cerasuola, born in the territory of Partinico and Monreale. Harvested between October and November, it is cold extracted and unfiltered to better express its aromas and its bitter fruity flavor with an artichoke aftertaste. Intense and pungent, characteristic of the land of Sicily. Extraordinary if used raw. THE OLIVE OIL Tola oil best expresses its perfumes and its unmistakable flavor when used raw: its medium intense and full taste, characteristic of the land of Sicily , the bitter fruity in harmony with the spicy and sweet notes, make it extraordinary in the exalting salads, crudités of fish and meat carpaccio , as well as vegetable soups , legumes and grilled. Furthermore, the quantity of polyphenols , or antioxidants , contained in the extra virgin olive oil Tola, which make it particularly healthy and indicated to be consumed in the context of a daily diet , as prescribed by the Mediterranean lifestyle, should not be underestimated. 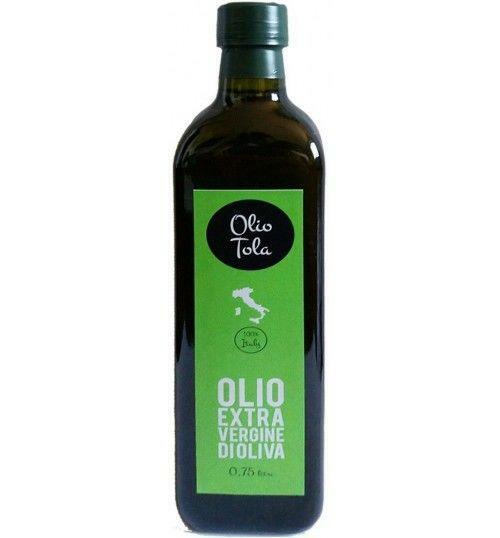 Tola extra virgin olive oil is a rather long-lived oil, thanks to the Cerasuola monocultivar from which it comes, which gives the product the ability to keep intact the peculiarities typical of the freshly pressed oil. Interesting is the limited edition "Nobile Saeculorum" of Tola extra virgin olive oil, an elegant and refined oil, with a golden-green color with golden streaks, obtained from the pressing of selected olives coming from centuries-old plants, which represent real historical testimonies of Sicilian olive growing. To be tasted raw , on a slice of homemade bread, to appreciate all the aroma. THE COMPANY A passion, that for olive trees, always present in the DNA of Salvatore and certainly transmitted by his father Vincenzo , dedicated as all the members of the Tola family, to the cultivation of olive groves distributed in the territories in the province of Palermo, between Partinico and Monreale . Since 2012, several years have passed well spent in the agricultural sector by Salvatore Tola , which nature has however been able to repay giving the company an excellent extra virgin olive oil all Sicilian, rich in polyphenols and antioxidants, a real elixir of long life. Extreme care and constant attention are at the base of the activity of Salvatore Tola, who looks almost fondly at the 1500 trees of the estate, all of the same variety, the fine Cerasuola cultivar. THE PHILOSOPHY The production of the Azienda Agricola Tola Salvatore is based on artisan practices, the result of the mix of different ingredients , from the area where the olive groves are found that is particularly fertile, at the right period of olive harvest, which takes place between October and November through the hand-picking, when the olives are 10-15% ripening, obviously in full respect of the plants. The result is an unmistakable, unfiltered oil with innumerable beneficial properties, cold extracted from selected olives , which are immediately stored and brought to the mill within a few hours of harvesting in anticipation of milling . Moreover, the pressing of the olives, one in the morning and one in the evening, guarantees to the final product a very low acidity and the optimal maintenance of all the characteristics, from the precious nutritional and organoleptic components to the pinching taste that makes extra virgin olive oil Tola . All production steps are monitored to ensure a high quality standard for the bottled product, to the detriment of the quantitative yield: from the tree to the table, the extra virgin olive oil Tola represents a genuine Sicilian olive juice . The territory of reference of the Azienda Agricola Tola is that of the DOP Val di Mazara , an ancient name of the Norman era that grouped Sicily into valleys. Here the diffusion of the cultivation of the oil has its roots in very distant times, demonstrating the fact that the area located has always guaranteed to the patient growers an excellent extra virgin olive oil. Among the typical varieties of this area of ​​production, the Cerasuola stands out, characterized by a medium intensity fruitiness. Tasting Color: green-gold with golden stripes Bouquet: sensations of freshly cut grass, artichoke and tomato. Taste: medium intense, bitter fruity, followed by a slight spicy note. Tola oil best expresses its perfumes and its unmistakable flavor when used raw: its medium intense and full taste, characteristic of the land of Sicily, the bitter fruity in harmony with the spicy and sweet notes, make it extraordinary in the exalting salads, crudités of fish and meat carpaccio, as well as vegetable soups, legumes and grilled. Furthermore, the quantity of polyphenols, or antioxidants, contained in the extra virgin olive oil Tola, which make it particularly healthy and indicated to be consumed in the context of a daily diet, as prescribed by the Mediterranean lifestyle, should not be underestimated. Tola extra virgin olive oil is a rather long-lived oil, thanks to the Cerasuola monocultivar from which it comes, which gives the product the ability to keep intact the peculiarities typical of the freshly pressed oil. Interesting is the limited edition "Nobile Saeculorum" of Tola extra virgin olive oil, an elegant and refined oil, with a golden-green color with golden streaks, obtained from the pressing of selected olives coming from centuries-old plants, which represent real historical testimonies of Sicilian olive growing. To be tasted raw, on a slice of homemade bread, to appreciate all the aroma. A passion, that for olive trees, always present in the DNA of Salvatore and certainly transmitted by his father Vincenzo, dedicated as all the members of the Tola family, to the cultivation of olive groves distributed in the territories in the province of Palermo, between Partinico and Monreale. Since 2012, several years have passed well spent in the agricultural sector by Salvatore Tola, which nature has however been able to repay giving the company an excellent extra virgin olive oil all Sicilian, rich in polyphenols and antioxidants, a real elixir of long life. Extreme care and constant attention are at the base of the activity of Salvatore Tola, who looks almost fondly at the 1500 trees of the estate, all of the same variety, the fine Cerasuola cultivar. The production of the Azienda Agricola Tola Salvatore is based on artisan practices, the result of the mix of different ingredients, from the area where the olive groves are found that is particularly fertile, at the right period of olive harvest, which takes place between October and November through the hand-picking, when the olives are 10-15% ripening, obviously in full respect of the plants. The result is an unmistakable, unfiltered oil with innumerable beneficial properties, cold extracted from selected olives, which are immediately stored and brought to the mill within a few hours of harvesting in anticipation of milling. Moreover, the pressing of the olives, one in the morning and one in the evening, guarantees to the final product a very low acidity and the optimal maintenance of all the characteristics, from the precious nutritional and organoleptic components to the pinching taste that makes extra virgin olive oil Tola . All production steps are monitored to ensure a high quality standard for the bottled product, to the detriment of the quantitative yield: from the tree to the table, the extra virgin olive oil Tola represents a genuine Sicilian olive juice. The territory of reference of the Azienda Agricola Tola is that of the DOP Val di Mazara, an ancient name of the Norman era that grouped Sicily into valleys. Here the diffusion of the cultivation of the oil has its roots in very distant times, demonstrating the fact that the area located has always guaranteed to the patient growers an excellent extra virgin olive oil. Among the typical varieties of this area of ​​production, the Cerasuola stands out, characterized by a medium intensity fruitiness.